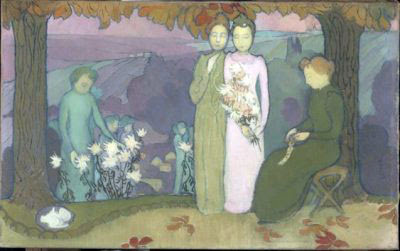 In 1892, this piece was exhibited at the 8th Salon des Indépendants, together with three other paintings – September Night, April and July – to make up a series entitled Poetic Subjects (four panels for the decoration of a girl's room). Although the series did not include Winter, it was often interpreted as a Seasons cycle, a theme already taken up by Poussin, Boucher, Cézanne and others, and which Vuillard would go on to tackle in 1892. The series could also be considered as the symbolic representation of four moments in a woman's life, October Night being that of engagement, the young woman in pink probably representing the Denis' betrothed, Marthe Meurier, accompanied by her sister, Eva. This decidedly symbolist scene could, then, be a token for the young artist's fiancée through which he expressed his feelings for her. Good-evening, Lotus. I stopped by to wander more deeply into your space and found more treasure troves. I never knew that many of my favourite artists were influenced by Japanese art until you featured them here. I'm a particular fan of Denis. imani--that's great to hear. i am constantly reading articles about them or bits of books, and rarely does it get mentioned, though they all thought so themselves! interesting, eh? i wonder why. It's very strange, and I found it a particularly startling absence when you did those posts on Alphonse Mucha. I think I've read a decent amount on him and it was never pointed out until I read of it here; then it became obvious when you placed his work beside certain Japanese pieces and I felt like a silly nit for not seeing it before. i'll tell you--i was sceptical when i first heard about it, but now i realize that it's far from just present-day critics suggesting it, it's what they were saying themselves. so i totally get what you mean!